Discussion in 'The Lounge' started by Jimmy_Pop, Aug 26, 2005.
so what happens if that dude loses weight?? oh my. 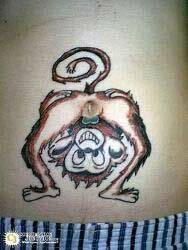 I just did a search for "funny tattoos" and got some really freaky stuff! ugh. what makes people think a tattoo likle that looks good??? a spoon! my kingdom for a spoon so i can gouge my eyes out! thats going to be fun to explain to the grandkids.